This is the seventh in a series of seven posts about How to Write Effective World Language Lesson Plans. In this post, we will be discussing how to choose effective practice activities, the, “guided practice” portion of the EDI lesson plan. We’ve done the song and dance, explained, modeled, demonstrated. We provided the best comprehensible input to give our students tons of repetition in context. We’ve checked for understanding and 80% of our students got it. Now, we want to give them sufficient practice for them to master the learning target. Students will write briefly about familiar topics using a series of simple sentences. Students will write complete sentences correctly describing the images and conjugating and spelling the verbs. Guide students to master the learning target? Allow me to conduct the class in the target language? Be meaningful communication or language in context? Allow me to continue to give comprehensible input? Involve many senses, use the whole body, or be hands-on? In order to reflect the target, students must write complete sentences. They must describe images. Therefore, I can project images of activities that the students can describe using complete sentences. Even when studying grammar (Yes, I believe in engaging the conscious mind in addition to activating subconscious acquisition) we should be focused on meaningful communication and, at the very least, on complete sentences or language in context. How about an activity with subject and infinitive in which students conjugate verbs? Students are not communicating or using complete sentences. How about a puzzle in which students write verb conjugations? How about a game in which students spell the conjugation of the verb, going around the room with each student saying one letter of the verb? WAIT! What learning target is that even addressing? Sure, it’s fun and students love it, but… fun is only part of the criteria and not even the necessary part. How about an activity in which students write a sentence using a given subject pronoun and an image? Confession time: Do I ever use a complete-the-sentence activity that isn’t authentic communication? Um… sometimes, but my goal is meaningful messages and communicative activities. If the activity doesn’t involve all the students, don’t use it. For example, two students go to the board and write the answers. What are the other students doing while they are writing? You might as well give them permission to start talking or checking their cell phones. When my students play the board game, (two students listen, then run to the board to touch the appropriate word), the rest of the class is shouting, “arriba, abajo, en medio, a la derecha, a la izquierda”. Everyone is involved. 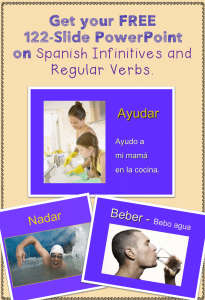 Click on the link, Lesson plan on Regular ER Verbs if you would like my Free Spanish One lesson plan on Regular Verbs. Or, if you would rather not spend hours creating your own lesson plans, CLICK HERE for Spanish One Lesson Plans and Curriculum for an Entire Year. Everything is done for you! Go home early! Next time you are crafting your practice activities, keep these ideas in mind. 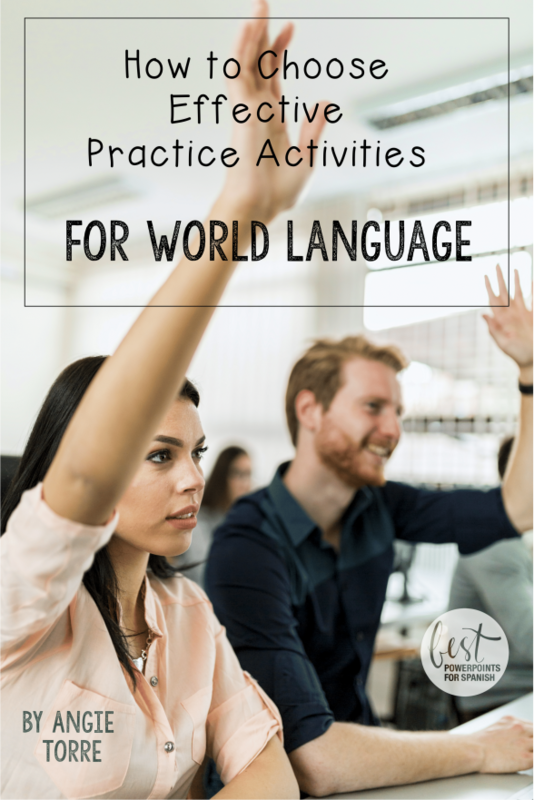 Now you know how to Choose Effective Practice Activities for your World Language class. Next time we will talk about how to choose or create closure activities and I will give you a free Lesson Plan Check List to simplify the lesson planning process. Stay tuned! If you would like to receive these tips in your email, sign up for my newsletter HERE and you will receive a FREE illustrated, 122-slide PowerPoint on Regular Verbs and Infinitives.